Package of 12 thin guitar picks. American celluloid material and Camo color. 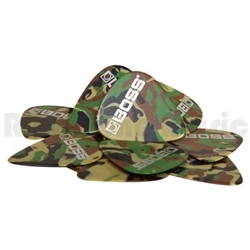 BOSS premium picks are manufactured with the highest quality materials for great feel and playability. They’re ideal for all styles, and feature clean, polished edges for easy control and consistent tone.